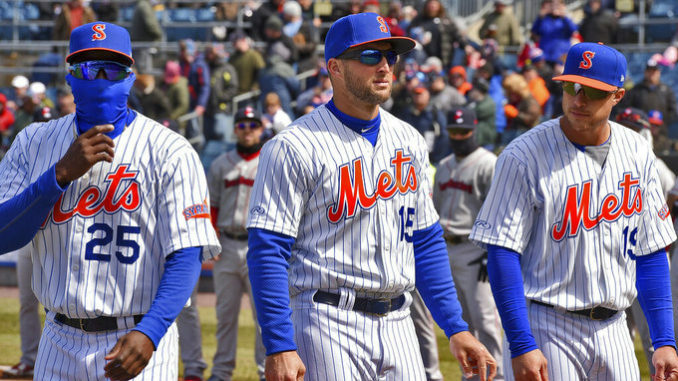 On Sunday night, the New York Mets will face off against the Atlanta Braves in the final game of the series. The Mets are 9-5 on the season while the Braves are 8-6. The Mets have taken 2 out of 3 games so far in this series. Jason Vargas got the start for the Mets but was able to record just 1 out before being pulled. He allowed 4 runs on 2 hits and had 3 walks. The bullpen was not good either, allowing 7 runs on 11 hits in 8 2/3 innings of work. The offense was solid in this one, led by Jeff McNeil and Juan Lagares who each had 2 hits. Seven other Mets had a hit in the game, and JD Davis was the only starter that did not record a hit. Sean Newcomb started for the Braves but was also pulled early. He allowed 4 runs on 5 hits and walked 2 in just 1 1/3 innings of work. Touki Toussaint was incredible in the relief. He went 6 innings and allowed no earned runs on 4 hits and 2 walks while striking out 7. Josh Donaldson and Nick Markakis each hit solo home runs in this game. Ozzie Albies, Josh Donaldson, Freddie Freeman, Ronald Acuna Jr., Nick Markakis, and Johan Camargo each had 2 hits in this game while Dansby Swanson had 1. Jacob deGrom will be on the bump for New York. He is coming off one of his worst starts in a long time. Last week he went 4 innings and allowed 6 runs on 8 hits and a walk and struck out just 3 batters. In his previous 2 starts, he went 13 innings without allowing a run while striking out 24 batters. The Mets have been dominated by Teheran in his career as they are hitting just .177 against him combined. Michael Conforto is 5 for 22, and Juan Lagares is 4 for 21. Robinson Cano has faced Teheran twice and has a double. Julio Teheran will be starting for the Braves in this one. He is coming off a poor start his last time out, allowing 6 runs on 5 hits and walked 3 in 5 innings of work. He is 1-1 with a 6.00 ERA in 3 starts this season. The Braves are hitting .236 against deGrom in his career. Ronald Acuna Jr. is 3 for 9 with a double and Brian McCann is 4 for 9. Freddie Freeman has gone 12 for 44 with 2 doubles and 2 home runs. Ozzie Albies has gone just 3 for 20. The Mets are -150. DeGrom is coming off a terrible start, and I don’t see that happening twice in a row. He is one of the best pitchers in the game and will bounce back with a great performance tonight. Teheran has dominated the Mets in his career but is struggling so far in 2019. I think the Mets will get to him as they are swinging some hot bats and deGrom will lead them to victory. Take the Mets -150.